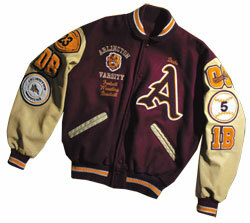 A letterman jacket or varsity jacket represents academic and athletic accomplishment at the high school and college level such as earning a varsity letter. Whether you already have your chenille letters, patches, emblems, and numbers, or you are having them custom manufactured by MOA Team Supply for up to 70 percent off regular price, you can rest assured that when you order a letterman jacket, you are getting the same high quality product you expect from a local sporting goods store in a fraction of the time! To make the process of ordering your letterman jacket stress-free, convenient, and as easy as buying movie tickets, we've provided a tutorial on How to Design a Custom Letterman Jacket and Varsity Letter, which we encourage you to read. Our stock jackets are available in 18 of the most popular, standard color combinations. Without custom chenilles or embroidery, they typically ship within as little as 24-48 hours. Custom jackets that have been designed to your exact specifications can be built in as little as 3-4 weeks. All of our letterman jackets feature huge built-in quantity discounts for teams, schools, organizations, corporations, and groups that are automatically applied when added to your cart. Whether you are ordering a single varsity jacket or you need hundreds for your team, we are confident that we can be your #1 supplier, just as we have with some of America's most respected institutions!